March 22, 2012 - Boeing on Tuesday issued a statement regarding the March 19 passing of former McDonnell Douglas chairman and CEO Sanford N. (Sandy) McDonnell, he was 89. “The people of Boeing extend our deepest sympathies to the McDonnell family, and join them in mourning Sandy’s passing. Sandy’s commitment to his colleagues and customers, his country, and his community during his 40-year career and throughout his lifetime, was extraordinary,” said Boeing Chairman, President and CEO Jim McNerney. Sanford "Sandy" N. McDonnell (1922 - March 19, 2012) was an American engineer, businessman and philanthropist. Former chairman and chief executive officer of McDonnell Douglas Corporation, he also served as national president of the Boy Scouts of America and as chairman of Character Education Partnership. He was "Man of the Year" in St. Louis in 1984. During World War II, Sandy McDonnell spent two years in the New Mexico desert casting uranium-238 for the then-top-secret Manhattan Project, which developed the world’s first atomic bomb. After the war, McDonnell joined McDonnell Aircraft, started by his uncle, James S. McDonnell, and took on a number of jobs from stress engineer, to aerodynamicist, to aircraft designer before his first management position, where he played a pivotal role in developing the highly successful F-4 Phantom II fighter jet. During his service with McDonnell Douglas, McDonnell had a strong interest in ethics. As a child, he had been a boy scout, rising to the rank of Star Scout. He continued as an adult to become an Eagle Scout. During his term with McDonnell Douglas, he used the Scout Promise as the basis for a work Code of Ethics. Following his retirement, McDonnell turned his focus to education and the need of focusing on character in public schools. After establishing a program in St. Louis public schools (the Personal Responsibility Education Process), he became founding chair of the national Character Education Partnership in 1993, a position he held until 2005. McDonnell has also served in other areas. In 1987, he became the first president of the Malcolm Baldrige National Quality Award, a national program in the United States to recognize organizations that "have a role-model organizational management system that ensures continuous improvement in the delivery of products and/or services, demonstrates efficient and effective operations, and provides a way of engaging and responding to customers and other stakeholders." Upon his retirement, Sandy devotes almost 40 hours of his time each week to working with charities, including CHARACTERplus, which teaches character building to more than 600,000 students in the St. Louis area. 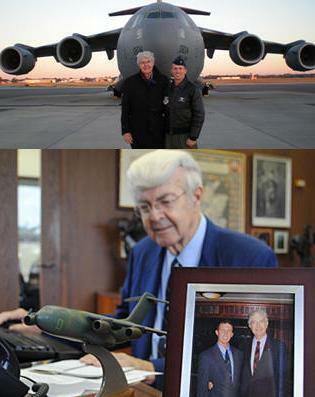 But one of the legacies he’s especially proud of is his 27-year-old grandson, U.S. Air Force Capt. William “Mac” MacVittie, who pilots a McDonnell Douglas-designed, Boeing-built C-17 Globemaster III transport jet supporting U.S. military operations and humanitarian missions. “I’m very proud of the outstanding young man that Mac has become,” McDonnell said from an office he still uses in Boeing Defense, Space & Security headquarters in St. Louis. “Every day, I think about where Mac might be, and it is most gratifying to know that he has chosen to devote his life to serve our country and fly one of our company’s heritage aircraft.” MacVittie, a U.S. Air Force Academy graduate, is stationed at Joint Base Charleston, S.C., from where the Air Force deploys dozens of C-17s on missions worldwide.